With a convincing victory in Friday night's Royal Purple 200 at Darlington Raceway, Kyle Busch scored his fifth Nationwide Series win of the season and the 48th of his career, leaving him one behind Mark Martin for the career victory lead in the series. 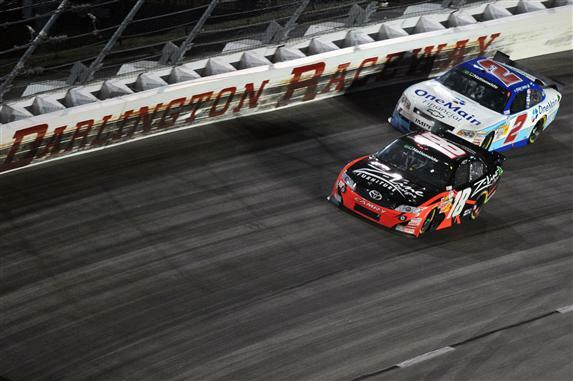 Busch beat Joe Gibbs Racing teammate Denny Hamlin to the finish line by 3.677 seconds. Elliott Sadler was third, followed by Nationwide points leader Justin Allgaier and Steve Wallace. Pit strategy moved Sadler to the front of the field, as crew chief Jimmy Elledge elected to keep the No. 2 Chevrolet out on the track under caution for Michael Annett's backstretch crash on Lap 89. Sadler passed Allgaier for the lead on Lap 108, but that didn't last. Busch, who had restarted ninth on Lap 104—after an eight-car wreck caused the fifth caution of the race—worked his way through the field and passed Sadler for the top spot on Lap 124. The eight-car melee on Lap 95 collected the cars of Carl Edwards and Kasey Kahne, both of whom had battled for the lead early in the race.